Worker rights and a decent wage represent a toxic brew to the ruling elite. In the past, they expressed their antiunion position in a crude fashion. From the 1870's through the 1920's, industrialists fought union growth with hired thugs and complicit law enforcement officials. Organizers and union members were harassed, maimed, and killedthroughout the country for simply acting on the right to organize and participate in a union. When union power and public decency prevailed, the elite shifted their efforts. The right to work movement emerged. Restrictive laws making it harder to organize unions became the main thread of crony capitalist efforts. Antiunion propaganda ran parallel to this backroom strategy. The image of the lazy worker and corrupt union boss became a mantra of right wing puppets. When unions did succeed, the elite offered union leaders the benefits of insider status in order to moderate their positions. The tactics varied around the world, but the strategy remained the same: reduce the size an influence of unions as a means of keeping wages low and profits through the roof. The tactics worked. Only Canada and Korea, in particular, showed growth in union membership since the 1970's. France and the United Kingdom saw substantial losses. Unions contracted at a slower rate in Japan and the United States. The impact was the same, loss of political influence for the union movement. When the British Labour Party produces a leader like Tony Blair, it is abundantly clear that Labour is a nominal term, not a union label. Even German unions joined the great decline in political influence and integrity. Membership is down to 23% of the work force. Top union leaders work with management by supporting national legislation to weaken the option to strike. Would you have paid health insurance today without a robust union movement a century ago? Probably not. In addition to health care, unions fought for and gained retirement plans, compensated sick days, and defined benefits plans. Corporations were unable to provide these benefits to union employees while, at the same time, denying them to middle managers and professionals. There remains a strong causal relationship between unionized firms and decent benefits and wages. 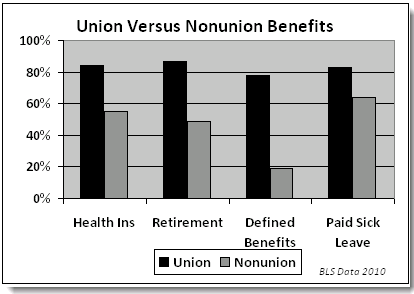 Unions confer advantages to nonunion employees as well. Union gains in the graph below form the foundation for a better quality of life. The benefits listed in the chart demonstrate the source of owner reactivity to union efforts. Meaningful benefits cost money that owners resent delivering to their employees. Union wages are higher than nonunion. The US Bureau of Labor Statistics just reported that the median weekly income of a union worker is $917 compared to $717 for nonunion workers, a 28% disadvantage. Despite the obvious advantages, union membership has declined markedly in the United States. There are fewer members today, 14.7 million, than there were in 1983 when 17.7 million workers belonged to unions. Only 11.9% of the workforce belongs to unions. The figure was 20.1% in 1983. The antiunion movement would have us believe that strong unions are incompatible with global competition. 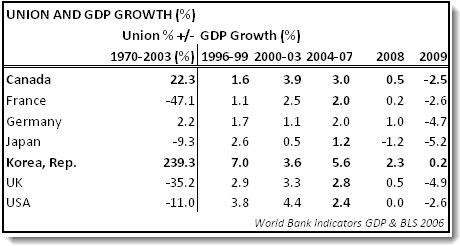 A look at the growth in gross domestic product (GDP, see graph below) shows that the nation with the most powerful union movement, the Republic of Korea, had the most consistent growth in GDP since 1996. Was the 239.3% increase in union membership an impediment to that nation's growth in GDP? Even with the onset of the 2008 economic crisis, Korea outpaced the other nations listed. While below Korean levels, pro union Canada experienced an average 2.6% GDP growth, equal to the US and ahead of the other nations with declines in union membership. Obviously, other factors influence economic growth. But Koreas exponential expansion in union membership along with the consistent record of growth is a persuasive counterpoint to the whining about unions hurting a nation's competitive advantage. There are two union organizations in Korea: the Korean Confederation of Trade Unions (KFTU) and somewhat larger Federation of Korean Trade Unions (FKTU). Both are in clear opposition to austerity programs and the labor disruptions caused by globalization and elitist contrived austerity programs. “It's been three years since the financial crisis hit the globe.…the most vulnerable members of the society including women, youth and the elderly as well as precarious workers whose number has been soaring due to the increased labour market flexibility are suffering from severe employment insecurity. Social polarization has been further deepened by the increasing number of working poor and widening income disparity. The KCTU platform represents positions on economic and social issues highly compatible with the most progressive movements in the world. The size, influence, and political philosophy of the Korean trade union movement represents the worst nightmare to the US financial elite. According to their antiunion theories, Korea should be impoverished. That is clearly not the case. The elements of a vital US trade union movement are shipped overseas on a regular basis. Those elements are well paying jobs. The $2 trillion in cash on hand at US coronations makes a mockery of the claim that they can't afford to keep jobs here. Who do the elitist owners think provided the labor and creativity responsible for those surpluses? The administration signaled its fundamental opposition to US manufacturing jobs when Treasury Secretary Tim Geithner announced generous tax cuts for US corporations. Part of the plan described involves eliminating current tax breaks to the manufacturing sector in order to cover the lost tax income from the proposed tax breaks for the multinationals. Some US unions and others strongly oppose ruinous globalization and austerity programs. The corporate media marginalizes these forces. Economic and social justice have no voice in the broad public dialog. At some point, citizens will see that the distinction between the working class and the middle class is arbitrary, divisive, and counterproductive. The vast majority of citizens are victimized by the calculated maneuvers of the financial elite. The politics of race, religion, and national security paranoia deny people the ability to understand and act on the truly global nature of crony capitalist manipulation and control. Hopefully, we will get the point before it's too late. Michael Collins is a Washington DC area citizen journalist who writes about the corosive influence of money on politics, and other corruptions of the new millennium. His ongoing series entitled The Money Party explores and exposes the bipartisan control of big money in the nation’s capitol and around the world. Collins wrote Election 2004: The Urban Legend which upended the mainstream media’s official story of the 2004 election results. His articles appear at various news sites and frequently on the front page of BuzzFlash.com. His web site is themoneyparty.org.